For a city of its size Malaga has not only a surprisingly large number of museums, but also a splendidly eclectic variety. Apart from the obvious, like the Picasso, Contemporary Art and Bullfighting museums, Malaga also has one of the world's best automobile museums, and museums of wine, music and glass. For details of the best see our listing below. The painter Pablo Picasso is undoubtedly Malaga's most famous son, and his museum in the heart of the old town now has nearly 300 works, housed in the beautiful 16th century Palacio Buenavista. Definitely unmissable for anyone with even a passing interest in art. In the basement you can see the 8th century Phoenician wall that is the oldest known structure in the city. Nearby in the Plaza Merced you can find Picasso's birthplace, which also has a small museum. Two minutes walk from the Plaza de la Constitución in the restored 16th century Palace Villalón, the Carmen-Thyssen museum, opened in 2011, has a number of Old Masters, and a collection that illustrates the development of Spanish painting from the Romantic landscape painters to the Spanish Modernism of the early 20th century. Very accessible, both physically and culturally, and also a sensible size for non-experts – big enough to be interesting, but not so big as to cause the glazing of the eyes that larger galleries can. Malaga Automobile Museum can be found a little way outside the city centre to the southwest, in the rather splendid old tobacco factory building built in the 1920s. The collection of immaculately preserved and restored vintage cars, spanning the entire period from the late 19th century "Belle Epoque" to the present, is equally splendid. All the famous marques are here – Bugattis, Ferraris, Rolls Royces, Cadillacs, Hispano Suizas and many more rub shoulders not only with collections of alternative vehicles like the Stanley steamer and modern solar powered cars, but also with the museum's collection of high fashion hats of the 1920s and themed artworks. Even if you're not an automobile enthusiast the museum is a great place to spend a couple of hours wandering around admiring these magnificent machines. The Contemporary Arts Centre in Malaga is one of the most popular galleries in southern Spain. Housed in a renovated Wholesale Market next to the river, it has acquired a reputation for innovation and teaching. The Antonio Ordoñez bullfighting museum is in the Malagueta Bullring and features "suits of light" (worn by the matadors and their assistants), photographs, posters and other memorabilia. Best view of the bullring is from the Gibralfaro castle. Housed in the former Victoria Tavern next to the Guadalmina River, this museum shows aspects of daily life in Málaga over the last few centuries in the appropriate setting of a typical patio house of the 17th century. A collection of more than three thousand pieces spanning several centuries, in a traditional 18th century townhouse with a lovely patio. 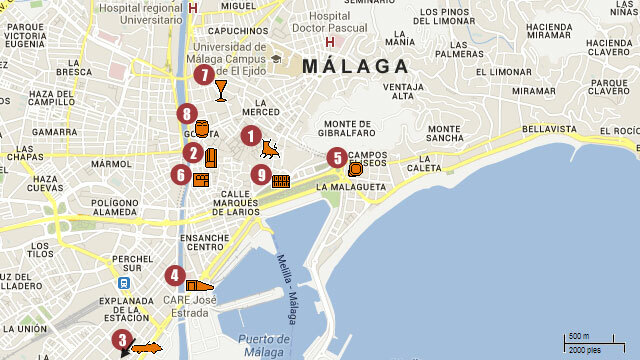 The wines and wine culture of the province of Malaga. The collections of the city's Fine Arts and Archaeology Museums, currently not on public display, will soon be moving to the Palacio Aduana (Customs house), which is currently being renovated for this purpose.